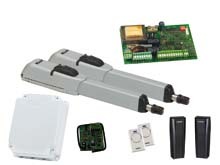 FAAC Electric gate automation kits, Barriers and Bollards. FAAC S800 (Hydraulic) Underground Kit. For residential and light commercial swing gates. 24V Hydraulic operator with integrated drive unit & Pump. 24v upto 4m & 800kgs per leaf. FAAC 750 (Hydraulic) Underground Kit. For residential and light commercial swing gates. 240V Hydraulic operator. 240v upto 3.5m & 800kgs per leaf. FAAC 770 (Electro-Mechanical) Underground Kit. For swing gates with leaves up to 3.5m, underground installation. Electromechanical gear motor irreversible. 240v & 24v 500kgs per leaf. FAAC 400 (Hydraulic) Arm Kit. For industrial swing gates with leaves up to 7m. 240 upto 7m per leaf. FAAC 422 (Hydraulic) Arm Kit. For residential and light industrial swing gates with leaves up to 3m, including 422 ped for pedestrian entry leaf. 240v from 0.8m upto 3m per leaf. FAAC S450 (Hydraulic) Arm Kit. For residential swing gates with leaves up to 3m. With new multi position fixing brackets. 24v upto 3m per leaf. FAAC S418 (electromechanical) Gate Kit. For residential swing gates with leaves up to 2.3m. With new multi position fixing brackets. 24v upto 2.3m per leaf. FAAC 415 (electromechanical) Gate Kit. For residential swing gates with leaves up to 4m. 24v upto 4m per leaf. FAAC 413 (electromechanical) Gate Kit. For residential swing gates with leaves up to 1.8m. 24v upto 1.8m per leaf. FAAC 412 (electromechanical) Gate Kit. For residential swing gates with leaves up to 1.8m and for bi-folding doors 1.5m. 240V & 24v upto 1.8m per leaf. FAAC 390 (electromechanical) Articulated Arm Kit. FAAC 391 (electromechanical) Articulated Arm Kit. For residential swing gates with leaves up to 2m. 24v upto 2m per leaf. FAAC 740 - 741 Sliding Gate Kit. For residential sliding gates max weight up to 900kgs. 240v & 24v upto 500kgs(740) 900kgs (741). FAAC C720 Sliding Gate Kit. 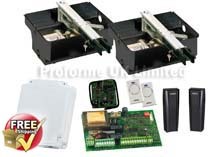 Low Voltage kit for residential sliding gates max weight up to 400kgs. 240v & 24v upto 400kgs. FAAC 746 Sliding Gate Kit. For sliding gates max weight up to 600kgs. 240v from 400kgs to 600kgs. FAAC 844 Sliding Gate Kit. For sliding gates max weight up to 2200kgs. 240v From 1000kgs upto 2200kgs. FAAC 884 Sliding Gate Kit. For large industrial sliding gates and intensive use max weight up to 3500kgs. FAAC B604 Automatic Barrier Kit. For beams upto 4m long, low voltage, ideal for small private areas. Wall fixing option, intergrated flashing light. FAAC 615 - 620 - 640 - 642 Automatic Barrier Kit. For beams from 3m to 7m long, Hydraulic operator with opening and closing lock, ideal for small, medium and large areas. Pneumatic and hydraulic rising bollards. Fitting and instructional manuals with dimensional illustrations. Take a look at the latest news in this industry, see how it is all pieced together.